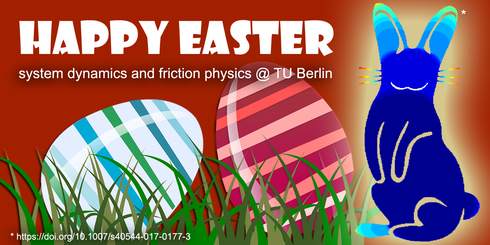 The Department of System Dynamics and Friction Physics wishes you Happy Easter! In the right side of the picture you can see the detachment of a flat, adhesive contact in the shape of an easter bunny. Prof. V. Popov since 2002. It is the only Institute in Germany which deals mainly with the physics of friction processes. Additionally, the department is a regular host to international conferences. Friction physics includes friction in the narrow sense, wear, lubrication, adhesion and contact mechanics and is therefore a huge area of ​​research, ranging from atomic force microscopy to earthquake research.